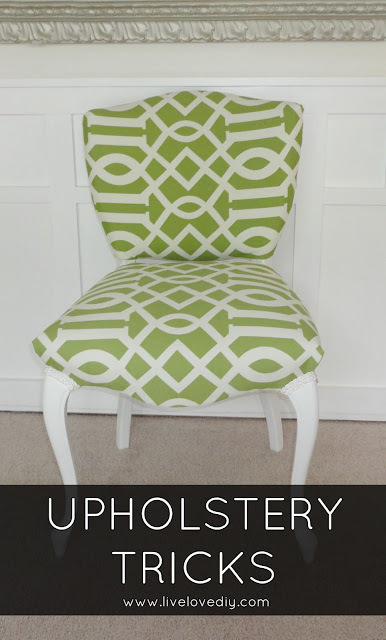 I've done several upholstery tutorials on the blog, and there are several FAQ's I get with every tutorial. They're the same questions I had when I first started playing around with upholstery, so today I thought I would share a few tricks I've learned along the way and answer one of your most frequently asked questions. First, let's check out the latest chair makeover. Remember this guy? The chair with the hot bod stuck in the old-man-recliner-fabric? 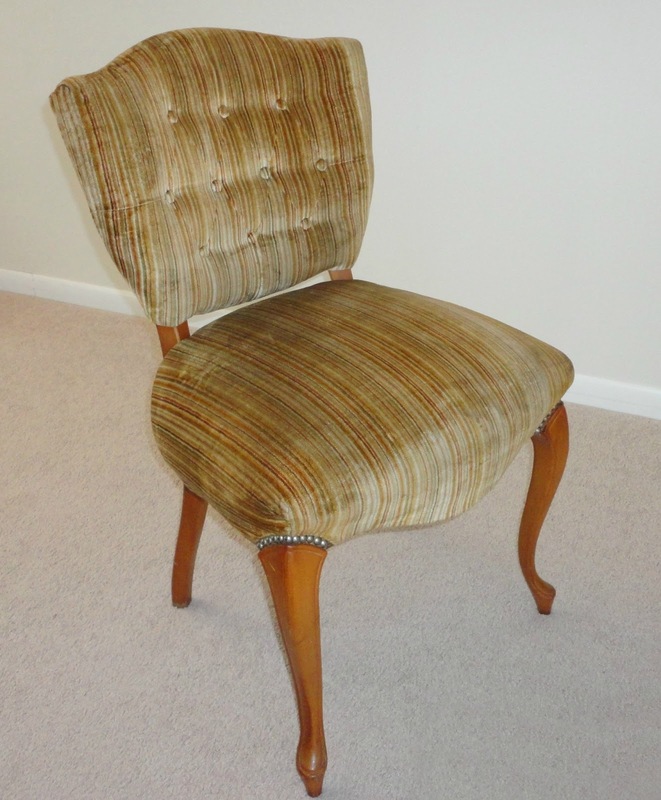 This will officially be the third time I've reupholstered this chair (see here and here) and hopefully the last. 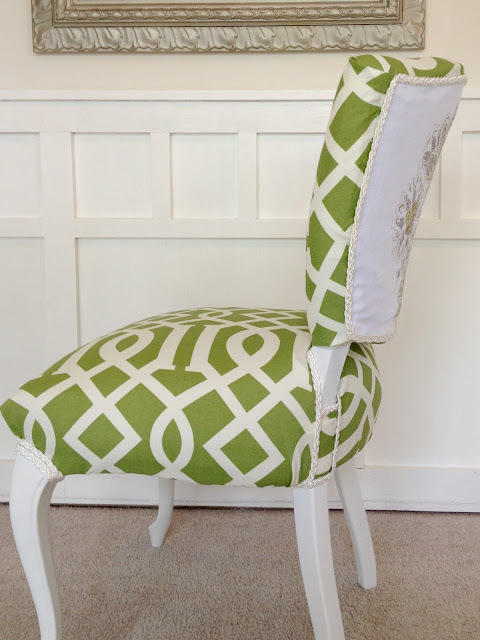 I chose a green and white Waverly fabric from Joann's, and I cannot wait to show you how amazing it looks in the room it's going in. I think it's quite the improvement! And when my math skills failed me and I ran out of material for the back panel, I decided to chop up an embroidered pillow cover and use it for the back. It sits against a wall, so it will probably never be seen anyways, but I kinda love the way it turned out. 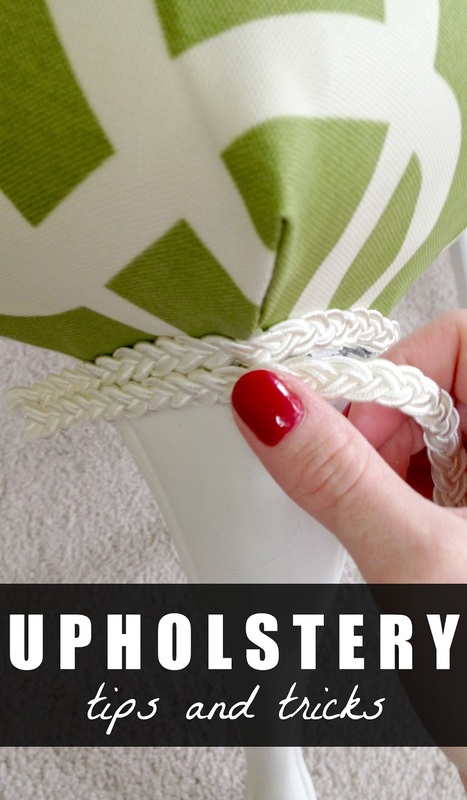 So, let's talk upholstery tips. One of the most frequently asked questions I get is 'How do I make corners?'. 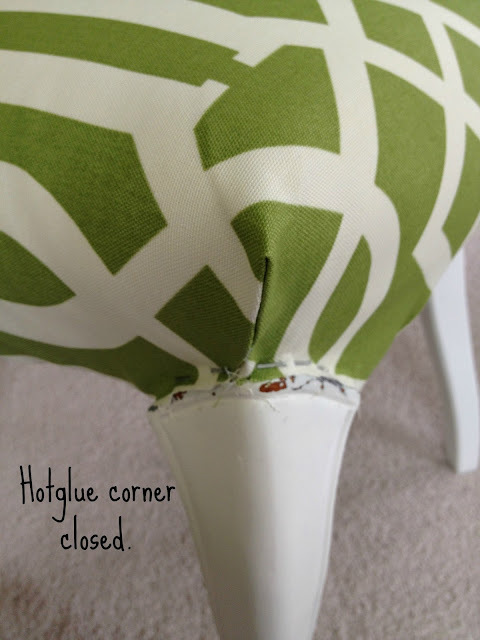 It took me a little trial and error to really figure out how to make a great corner. 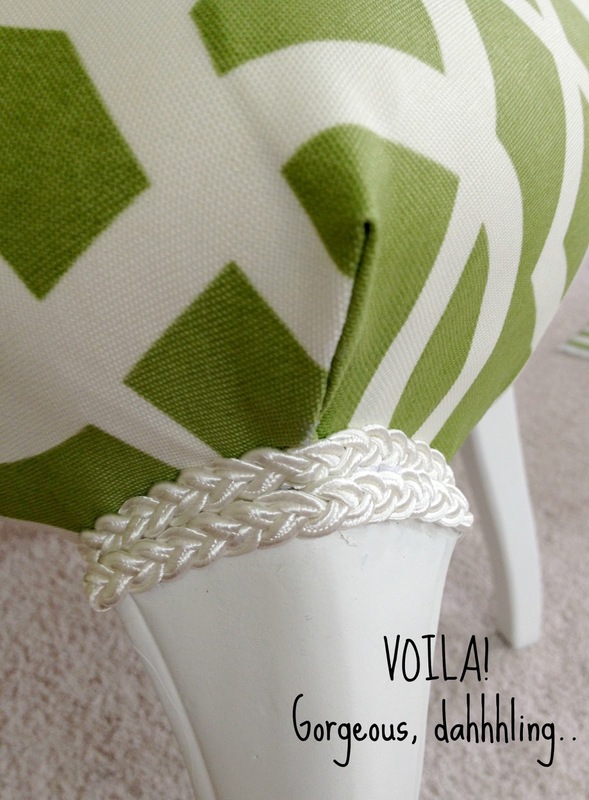 Since a botched corner can totally make or break your DIY upholstery job, it's a handy skill to have. Here's how I do my corners. I have no idea if this is the right way, but it works and it's easy. The first thing I do once I have my fabric cut to size and positioned on the chair correctly is to staple the fabric around the top of the leg and trim the fabric underneath the staple afterwards. Next, I cut off the corner, leaving about 1-2 inches. 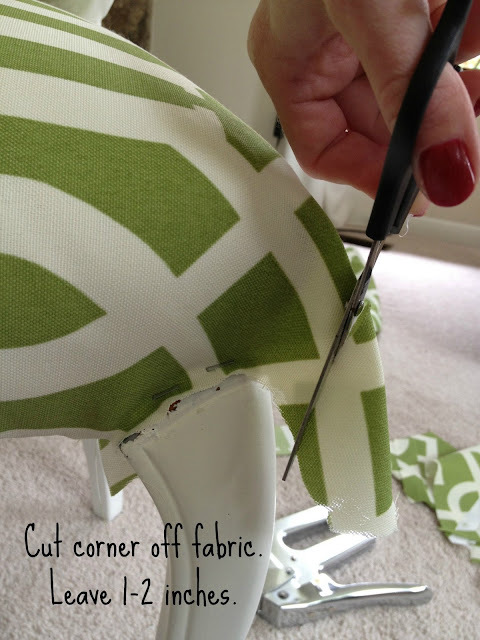 Then, push the fabric inward and create a pocket. Once the fabric is tucked all the way inside and you have what looks like a seam, hotglue it closed. 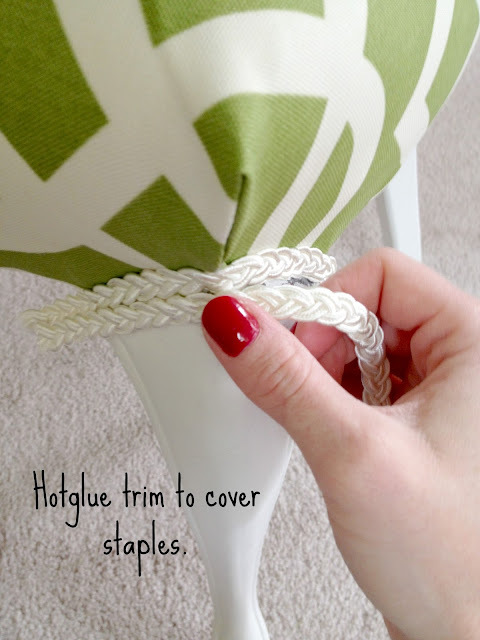 Then, hotglue your trim or piping around the leg. This covers up the staples and any other little imperfections. I used two strips of trim. 'Cause I'm crazy like that. a neat little corner on your freshly upholstered chair! So tell me...What other upholstery questions do you have? Feel free to leave them in the comment section below and I'll try to include them in my next upholstery post.